One of our goals in the digital collections area is to extend our expertise in digitization to community partners to help those organizations that don’t know how or don’t have the time and resources, to digitize and get their materials online. This year we did pilot community projects with two local organizations and they were a great success. We hope to take what we’ve learned from these projects and continue to partner with local partners to bring Tallahassee’s rich history online. The latest community project to come online is the first of many sets of materials from the First Baptist Church of Tallahassee. The First Baptist Church has been a cornerstone in Tallahassee for many years. Founded in 1849, its collection not only reflects the history of the church but also of Tallahassee. Due to the church’s close proximity to FSU, it also holds the stories of many of our students over the years who participated in the Church while calling Tallahassee home. We’ve started our project with the church bulletins. The collection begins in the 1930s and we are working our way up to the present day. These materials will be uploaded into DigiNole: FSU’s digital repository in batches as digitization is completed. For more information about First Baptist Church, please visit their website. You can also explore the digital collection in DigiNole. Be aware we are loading this first batch still so new items will be added up to 1959 over the next few weeks. On January 21, 1801, Charles Louis Napoleon Achille Murat was born to Joachim and Caroline Bonaparte Murat, Napoleon Bonaparte’s youngest sister. Through the family’s connections with the Emperor, Joachim was eventually made King of Naples, hence the Prince Murat title. Upon the Emperor’s second defeat in 1815, Achille’s father was executed and his mother fled with her children to Vienna. Achille would emigrate to America upon his 21st birthday in 1821 and became a naturalized citizen fairly soon after, renouncing all his titles. 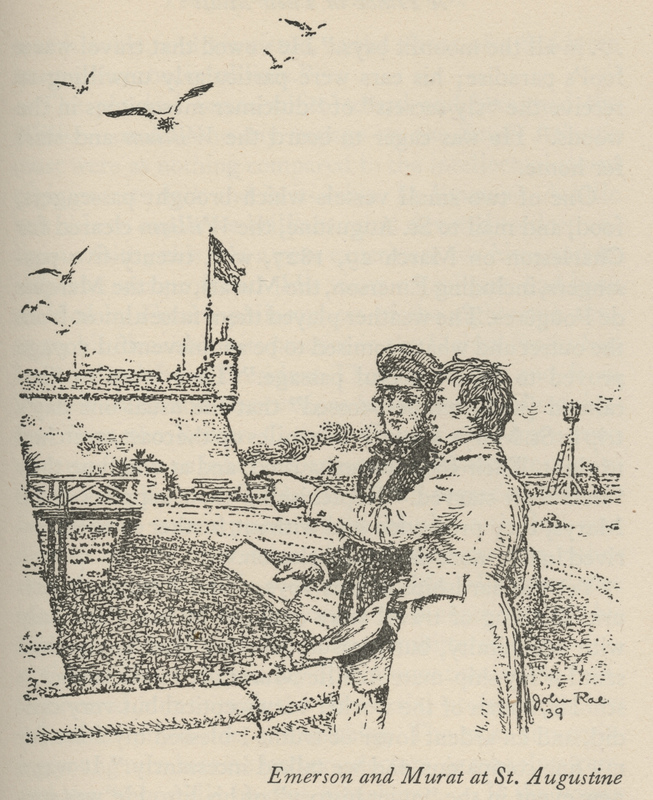 After roaming the country, he settled in Washington DC where he happened to become friends with Richard Keith Call, Florida’s territorial delegate to Congress who told the young man of the many opportunities in the newly acquired territory. Murat settled first in St. Augustine but later purchased his Lipona Plantation outside Tallahassee after much prodding from the Marquis de Lafayette. 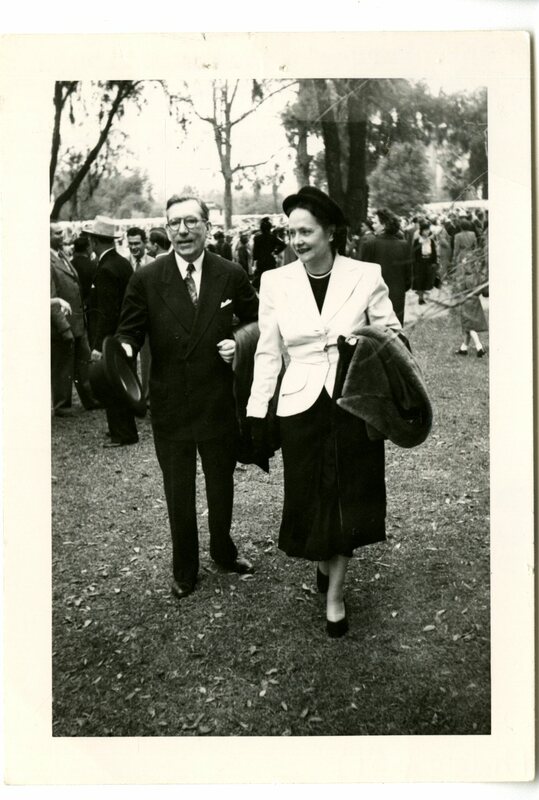 It was in Tallahassee that Murat met his future wife, Catherine Daingerfield Willis Gray, great grandniece of George Washington. Murat was also a part of Florida’s militia and would hold the rank of colonel for the rest of his life following the Seminole Wars. A man of many interests, Murat was a writer. He, along with his fellow countryman Alexis de Tocqueville, wrote much on American culture and lifestyle during his lifetime though Murat’s writing never became as popular as Tocqueville. He also had a close friendship with Ralph Waldo Emerson whom he met in St. Augustine in 1826. 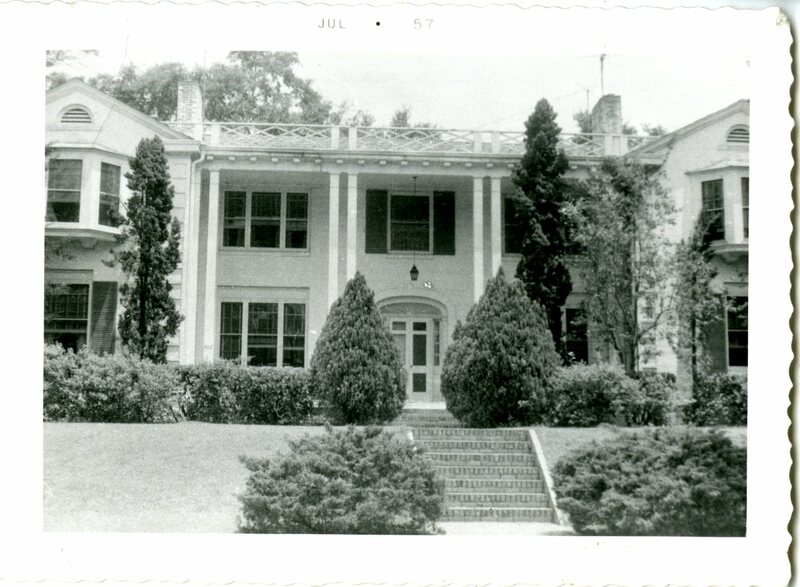 After an attempt to regain some of his family’s fortune in the July Revolution of 1830 and several unsuccessful years in New Orleans, Murat and his wife moved back in Tallahassee in the mid 1830s and Murat would remain here the rest of his life. Murat died in 1847 and is buried in the St. John’s Episcopal Church cemetery in Tallahassee. Recently, through the efforts of a local group, the historic marker outside the cemetery where Murat and his wife are buried was restored after mysteriously vanishing a year ago. You can read about the new marker and those who helped get it back in place on the Tallahassee Democrat’s website. With the 50th anniversary of Dr. Martin Luther King Jr.’s “I Have a Dream” speech today, we revisited the collections we hold regarding the Civil Rights Movement right here in Tallahassee. Among our most popular and unique is The Tallahassee Civil Rights Oral History Collection, which chronicles the experiences of nineteen individuals who were involved in the civil rights movement in Tallahassee during the late 1950s and early 1960s. The interviews were conducted and donated to Special Collections by Dr. Jackson Lee Ice, a professor of religion here at FSU. Ice arrived in Tallahassee in 1955, nine months before the Tallahassee bus boycott. He was a witness to and a participant in the civil rights activities and social changes that affected Tallahassee during those years. Ice came under heavy criticism from local political figures for his statements supporting the rights of African-Americans to demonstrate and perform civil disobedience for their cause. He was almost fired from his FSU teaching position. It was because of his work with the Tallahassee Council on Human Relations that he became acquainted with many local African-American leaders and participants and familiar with the issues and problems they faced. 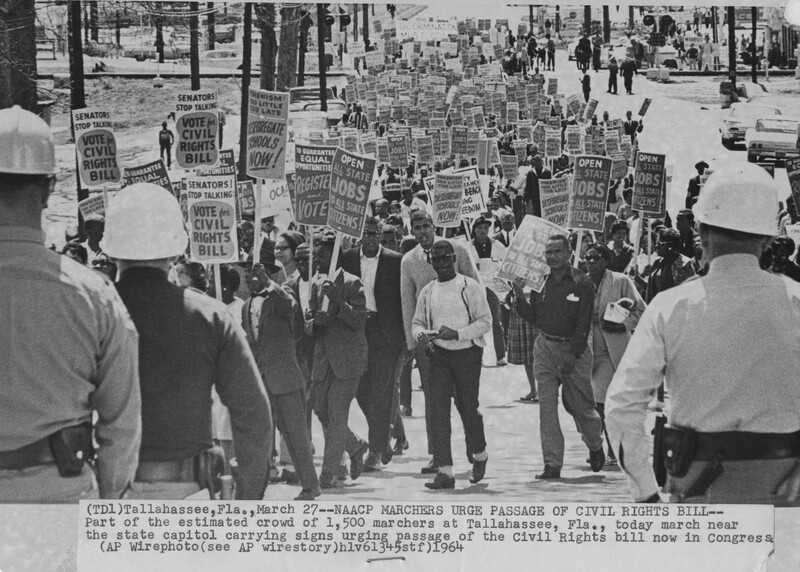 Through this experience, Ice became convinced of the importance of the activities of the Tallahassee Civil Rights Movement in our nation’s history. Primarily, he wanted to record these events, as told by individuals who witnessed them, before they faded from memory. He also wanted to enlighten his students about what took place during this era of racial tension, courage, and sacrifice and the role that Tallahassee played nationally in the civil rights struggle. 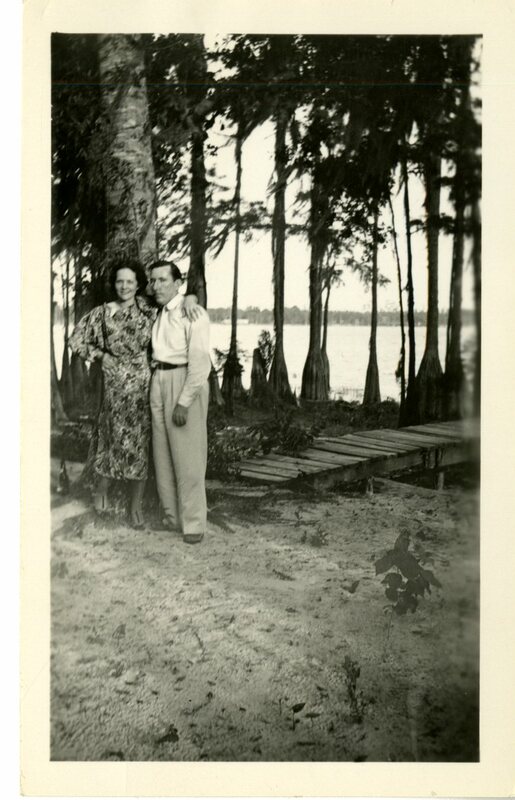 Working for the Florida State University Center for the Study of Southern Religion and Culture with funding supplied by a Rockefeller Foundation grant, Ice taped a series of interviews with people who were residents of Tallahassee during that era. He selected a representative sample of civil rights advocates and their opponents and interviewed them during the summer of 1978. Reverend C.K. 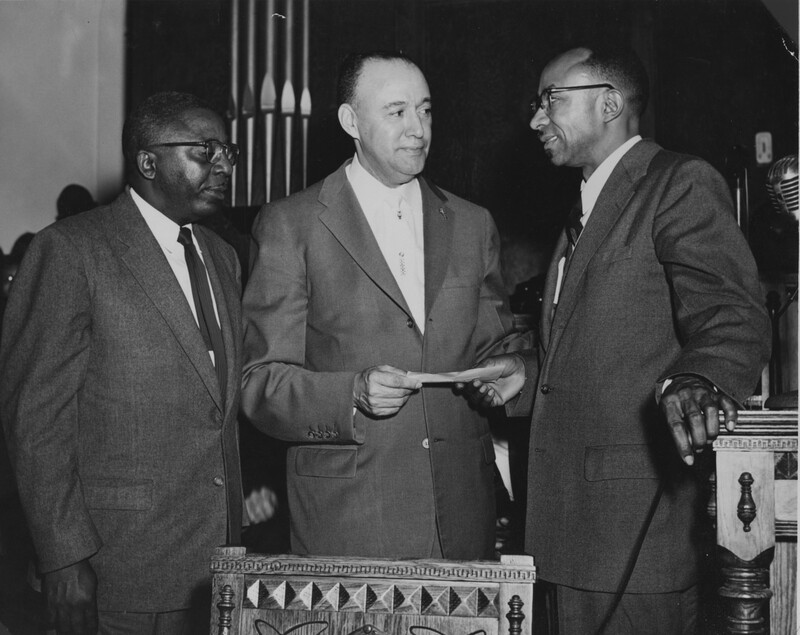 Steele accepting a check given to him by Reverend Raymond Henderson. In 2003-4, the audiocassettes were transferred to CDs with help from a National Historical and Publications Records Commission grant. Three of the interviews are currently available online: Reverend C. K. Steele, Charles U. Smith and King Solomon Dupont. Detailed descriptions of the interviewees and summaries of the interviews can be read in the full finding aid for the collection here. Through these interviews, we discover how Tallahassee was both being affected and contributing to the civil rights movement of the early 1960s, a volatile time in the south during which Dr. King delivered his famous speech on the steps of the Lincoln Memorial. Photo credits: Florida State University Office of Multicultural Affairs Records, Special Collections, Florida State University Libraries, Tallahassee, Florida. FSU Special Collections and Archives are pleased to announce the launch of a new online exhibit, Integration at Florida State University. Created in honor of the 50th anniversary of integration at FSU, the Florida State University Libraries have combed Special Collections and University Archives to bring headlines, stories and images from the era to you. 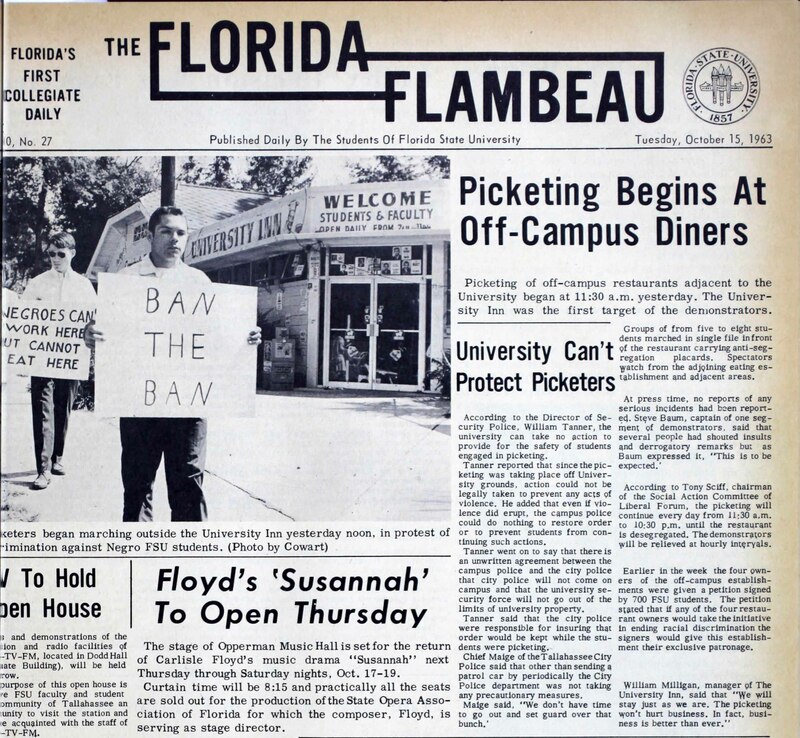 The exhibit includes newspaper articles from the FSU student newspaper, The Florida Flambeau, that document the activities of students, not only on campus towards integration, but student activism in the civil rights movement in greater Tallahassee. Photographs and documents share many firsts for minorities on campus, as well as sharing their struggles to earn equality in the eyes of faculty, staff, and their fellow students. Our goal is to present original materials from the time as a tool for research, exploration, and discussion so it is offered with little contextual information.